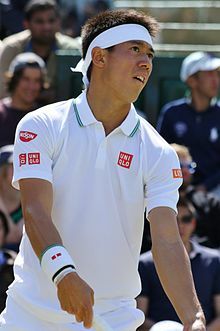 Kei Nishikori (錦織 圭, Nishikori Kei) (born 29 December 1989 in Matsue, Shimane, Japan) is a Japanese tennis player, currently ranked Warld No. 11 as o Juin 17, 2013. He began playin tennis at the age o five an qualified for his first ATP main draw event at the Countrywide Classic in Los Angeles at the age o 17. Nishikori wis named ATP Newcomer o year in 2008. He haes wan 3 singles titles, reached the quarter-finals o the 2012 Australian Open. On Juin 17 2013, he reached a career-heich singles rankin o Warld No. 11. This page wis last eeditit on 17 Mey 2017, at 17:52.